A founding father of the “art of philology,” Aristarchus of Samothrace (216–144 BCE) made a profound contribution to ancient scholarship. In his study of Homer’s Iliad, his methods and principles inevitably informed, even reshaped, his edition of the epic. 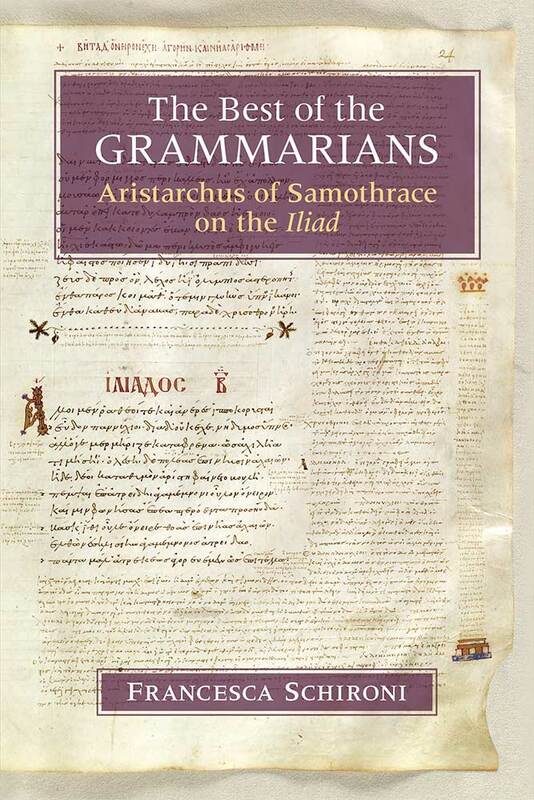 This systematic study places Aristarchus and his fragments preserved in the Iliadic scholia, or marginal annotations, in the context and cultural environment of his own time. Francesca Schironi presents a more robust picture of Aristarchus as a scholar than anyone has offered previously. Based on her analysis of over 4,300 fragments from his commentary on the Iliad, she reconstructs Aristarchus’ methodology and its relationship to earlier scholarship, especially Aristotelian poetics. Schironi departs from the standard commentary on individual fragments, and instead organizes them by topic to produce a rigorous scholarly examination of how Aristarchus worked. Combining the accuracy and detail of traditional philology with a big-picture study of recurrent patterns and methodological trends across Aristarchus’ work, this volume offers a new approach to scholarship in Alexandrian and classical philology. It will be the go-to reference book on this topic for many years to come, and will usher in a new way of addressing the highly technical work of ancient scholars without losing philological accuracy. This book will be valuable to classicists and philologists interested in Homer and Homeric criticism in antiquity, Hellenistic scholarship, and ancient literary criticism. Jacket: Gr. Z. 454 (= 822), f. 24r. Courtesy of Ministero dei Berri e delle Attivita Culturali e del Turismo - Biblioteca Nazionale Marciana. Reproduced by permission. Francesca Schironi is Professor of Classical Studies at the University of Michigan.